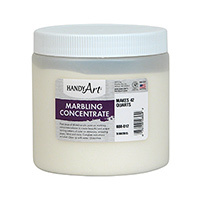 Handy Art® Marbling Concentrate offers the chance to discover the art of marbling. Create beautiful, bright and unique swirling patterns of color on stationary, wrapping paper, clothing and more. It all starts with a thickened solution of water, floating drops of diluted acrylic paint and gently created patterns which are then transferred to your project. Complete instructions with pattern ideas included. A fun activity for all ages! Handy Art® Marbling Concentrate is certified AP non-toxic.